Mayor Rahm Emanuel never mentioned Mayor Daley once on Monday, but he left no doubt about who's to blame for the city's "lemon" of a parking-meter deal. CITY HALL — Without mentioning his predecessor by name, Mayor Rahm Emanuel put the squeeze on former Mayor Richard M. Daley for the "lemon" of a parking-meter deal Daley left behind. "A city normally known for its differences has come together in universal anger over the deal," Emanuel said Monday in announcing amendments to the contract, including free Sunday parking in the neighborhoods. Yet, before Emanuel went into the new details, he aimed to politically tap into that public anger by lambasting the original deal and the way Daley got it approved by the City Council. 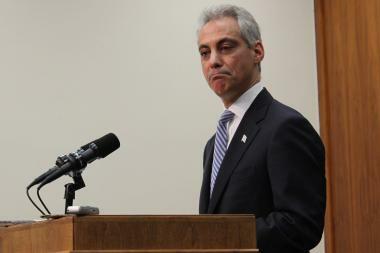 "This was a bad deal for our city and a bad contract for our residents," Emanuel said. "The city should never have done this deal. Period." In the midst of a budget crunch and the economic downturn of late 2008, Daley pushed the original deal with Chicago Parking Meters through the City Council in December in a matter of days and with little time to consider it. The city received $1.157 billion from a 75-year lease. Within six months, David Hoffman, then the city's inspector general, was saying the contract undervalued the city's meter system by some $974 million. Daley went on to spend much of the upfront money on budget shortfalls in subsequent years before leaving office in 2011. "This deal was badly negotiated," Emanuel said Monday in no uncertain terms. "At 75 years, the deal was too long. The price at the meter has gone up too much too quickly." Emanuel also struck at how the contract had no escape clause and put no cap on CPM profits. The mayor also swiped at the Daley administration for using much of that upfront money on short-term budget gaps, making it all but impossible for the city to pay the money back and attempt to back out of the deal. In announcing a settlement on contested fees for lost revenue on street closures, Emanuel said pointedly, "The company knows now that I'm a different type of mayor." Longtime Daley spokeswoman Jackie Heard responded, "The mayor is away at a conference and is unavailable for comment." "This does not solve our parking-meter problems," Emanuel said. "That's just not possible. I'm trying to make a little lemonade out of a big lemon," adding, "We did make it a little less bad for the next seven decades." Emanuel concluded with one last jab at Daley by saying ordinances on the new parking-meter deal would be delivered to the City Council at its meeting May 8, with a month to consider the package before the next meeting, "time that wasn't provided the first time around."